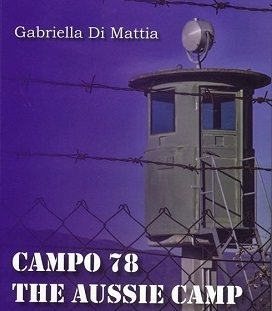 On Tuesday 16 February 2016 my spouse and I attended the official launch of Gabriella Di Mattia’s book Campo 78: The Aussie Camp, a book about the Australian soldiers detained during WW2 in the POW Camp near Sulmona, Abruzzo, Italy. The launch took place at the Museo Italiano, Co.As.It, in Carlton Victoria. We were interested because Orlando was born in the village of Pacentro, near Sulmona. Gabriella Di Mattia was born in Melbourne in 1961. When she was 10 years old her parents decided to return to Sulmona in the Abruzzo, where they were both born. Initially Gabriella felt lost and disillusioned by this decision of her parents, but gradually she began to appreciate and enjoy her new lifestyle. At school Gabriella continued to study English in order to maintain her links with her aunts, uncles and cousins back in Melbourne. She attended university in Abruzzo. 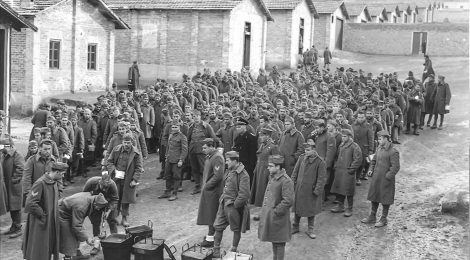 Gabriella subsequently initiated research into the Prisoner of War camp, Campo 78, located at Fonte d’Amore, 5 km from Sulmona. On the wall of one of the huts she identified the Australian Commonwealth Military Force emblem, sparking an interest in her she had not foreseen. Her research led her to estimate that amongst the 3200 POWs who were captured in the North African campaign and known as the “Desert Rats” there were approximately 500 Australians. Until then, these men had always been identified as British. This extraordinary discovery led Gabriella to write a bilingual account of the Australians detained in Camp 78. She recognized the important link between her homeland and her adopted country and felt in a unique position to deepen the knowledge and awareness of events which occurred about 70 years ago. She interviewed a number of the prisoners’ families and documented their stories. In one such story a 6 year old girl in Sulmona offered a piece of fruit to a very tired and hungry Australian soldier – a small incident in a very long war. The girl married in 1956 and because of poverty in the Abruzzo during the 50s the family emigrated to Adelaide. One day in the 1960s the woman was shopping in a butcher’s shop when she became aware of an Australian man watching her intensely. Feeling somewhat concerned she looked away. The man then approached her and said “I know you”. Feeling rather intimidated she replied “No. I do not know you.” “Yes you do” was the reply. “I met you in a faraway land. You were the little girl who gave me some fruit outside the camp at Fonte d’Amore in Italy. You were the little girl I have held in my heart since that day. Finally I have found you.” They hugged and were both in tears. Burt Boucher, a tough ex-sergeant had never returned to Italy. For the rest of his life in Australia he treated Anna Mastrangioli and her family as his own, assisting where he could, and looked upon Anna as his daughter. This is one of the stories of the Aussie POWs from the Sulmona camp, how they got there and how they found life in the camp. Other stories describe the attempts of some to escape and evade capture after the Armistice in September 1943. The book provides personal, often emotional accounts, based mainly on interviews with family members or diaries kept by some of the men, rather than official records, as very little was documented. (The Australian War Memorial has some data on troop movements but little detail on specific camps or the fate of the Australian soldiers.) I enjoyed reading this book, which has certainly stirred my curiosity to visit the camp in Fonte d’Amore during our trip to Pacentro in June this year.